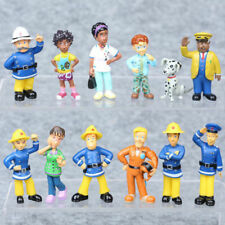 Fireman Sam Figures x 11. In good played with condition. Great toy gift for children, friends or yourself. Can be used as a decoration, collection or gift. Material: PVC Plastic. may take up to 4~8 weeks due to strict Custom Inspection. Size: Approx. These include: Elvis, Steele, Sam, Dilys, Helen, Norman, Tom Thomas,Penny. Great toy gift for children, friends or yourself. Fireman Sam Bundle In Good Condition. One door on ambulance missing. Fun driving game. Wheel steers Jupiter on screen as the road moves. Turn on the engine with the key. Press buttons for sound effects etc. Also a quiz involving the characters and numbers. Fully working, tested and clean (just needs batteries) Purchased from toys r us for £39.99 so grab a bargain for hours of fun! Friction Action Jupiter with opening doors and working ladder. Jupiter is missing door mirrors & fire hose. Friction Rescue Vehicle with opening doors. Unwind Jupiter's extendable fire hose. FIREMAN SAM Mug. The mug is High Quality straight sided white 10oz design. New Dishwasher Microwave Proof Mug. I can put any picture you like on the mug or a combination of text and picture. Size of mug. Free-wheeling wheels!Doors open!Scaled for play with Fireman Sam Little Characters figures (sold separately).Make up your own Fireman Sam Rescue Adventures!No batteries required.Join Handyman Mike Flood as he drives his van around Pontypandy, making sure everyone's houses are in working order. Open up the back doors, put Mike's toolkit in the van, then roll it along on the free moving wheels. The Fireman Sam Mike's Van is suitable for fans of the TV show aged 3 and up. 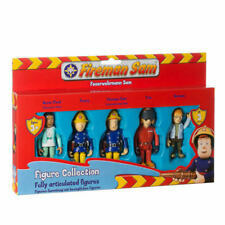 This is a lovely little Fireman Sam bundle. ideal for any young Fireman Sam fans! ❤️LARGE TALKING / SINGING FIREMAN SAM PLUSH TOY & TALKING QUIZ WHEEL ❤️. This fantastic large plush Fireman Sam can be taken on any fire fighting adventure. Huge Firestation playset with Fire Engine turn table. Includes bell on the side of the station. Fireman Sam Transformer Type Fire Engine Figure. Good used condition with some minor sticker damage. A very simple transformer type toy, great for preschool aged children. Please feel free to ask any questions. Collection welcome from Paignton TQ3 area. I am happy to combine shipping where possible. Please ask for a quote. From a smoke free and pet free home. Have a look at my other items for more great bargains. Fireman Sam Friction Action Jupiter. Fireman Sam Toy - Push Along Fire Truck. Condition is Used. Dispatched with Royal Mail 2nd Class. Fireman Sam Rescue Playset. Rescue Helicopter with push button rotor blades. Fristion Rescue Vehicle. 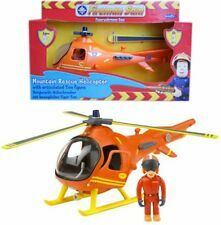 FIREMAN SAM BUNDLE FIGURES, HELICOPTER, STATION, FIGURES, VEHICLES. A soft plush toy, the Fireman Sam character, used and in good condition overall however it does have staining. KEPT AT NANNYS HOUSE SO HARDLY PLAYED WITH. Fireman Sam original figure.3"(7cm) high. With moving parts Excellent condition. MOVABLE ARMS HEAD & LEGS. The truck has a water tank with a fire hose which can actually squirt water out. The set includes the Venus fire engine, fireman Elvis, a water tank, a fire extinguisher, a barrier and a first aid kit. Fireman Sam Jupiter with sound: Hurtling through Pontypandy with the siren wailing! If Fireman Sam and his friends are able to rely on one thing, it's on their fire engine Jupiter. The robust and highly detailed toy brings action and adventure into the playroom. Action Fire Engine Ride-On - Sounds - Working crane & Water Squirt Function role into rescue mode. Action Fire Engine Ride-On - Sounds - Working crane & Water Squirt Function. Water squirt function. This Fire engine, has a siren sound and blinking light. Have your own Fireman Sam adventures. Includes: Working torch, walkie talkie, axe, utility belt and fire-fighters jacket. Fit accessories onto utility belt. Contents: Working torch, walkie talkie, axe, utility belt and fire-fighters jacket. Fireman Sam Jupiter Fire Engine. Let your imagination run wild as you create new adventures with Fireman Sam. Save Pontypandy with Fireman Sam! This fire engine has a crane arm and hose for you to play with. Nee-Nor, nee-nor! Fireman Sam is coming through! Join Sam on his latest adventure with this fantastic fire engine. Fireman Sam Drive and Steer. Mute button for quiet play. Steering wheel with turn, forwards, reverse, turbo and siren!